PLO chief negotiator says that despite being reluctant to support the French peace initiative, Kerry will attend a May 30 summit in Paris. 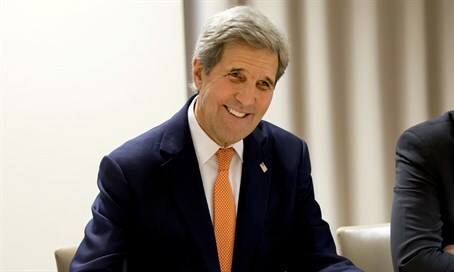 Secretary of State John Kerry is planning to attend the preliminary foreign ministers' meeting that France is convening in advance of a French-sponsored Middle East peace conference, Haaretz reported Monday. The Palestine Liberation Organization's Saeb Erekat told the newspaper that Kerry has told Palestinian Authority chairman Mahmoud Abbas that he plans to attend the summit, to take place in Paris on May 30. At this stage, however, State Department officials will not confirm that Kerry will be attending the foreign ministers' meeting, and Washington has been reluctant to express support for the French initiative. For his part, Erekat told Haaretz that Kerry and Abbas spoke by phone three days ago and Kerry made clear his intention to attend the foreign ministers' meeting. Until now, Kerry hasn't announced whether he'll attend the summit, and made no public statement on his stance about the event, which Jerusalem opposes. In his daily briefing for reporters, noted Haaretz, State Department spokesman John Kirby said no final decision has been made on Kerry's attendance and that the Americans had informed the French that Kerry was not available on May 30. Kirby acknowledged for the first time, however, that contacts have been underway between the United States and the French over whether the foreign ministers might meet on another date, enabling Kerry to attend. Back in January when the French initiative was announced, Paris had threatened to unilaterally recognize the "state of Palestine" if the talks failed. Since then, French Foreign Minister Jean-Marc Ayrault backtracked on the threat, saying France would not “automatically” recognize a Palestinian state if its initiative fails. Ayrault was in Israel on Sunday in an attempt to convince Prime Minister Binyamin Netanyahu to back the initiative, which he has outright rejected. Following his meeting with Netanyahu, the French minister indicated that despite Israel rejecting the initiative, that initiative will advance regardless. "France has no vested interest, but is deeply convinced that if we don't want to let the ideas of the Islamic State group prosper in this region, we must do something," Ayrault told reporters at the airport after meetings with Netanyahu and Abbas.